'Metoac' is a geographic rather than a political grouping of the tribes of Long Island. For no other reason than the fact that Manhattan was also an island, the tribe of that name is often included under the 'Metoac' label. 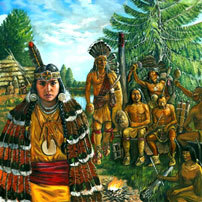 Linguistically, the tribes on Staten Island are considered to be of the Unami sub-division of the Lenni-Lenape (Delaware). Since all of the Long Island tribes were culturally similar, not only to each other but to other south-coastal tribes in New England, and there is no general consensus on their classification, the word 'Metoac' is an acceptable term of convenience. The 'Metoac' were an agricultural people who complemented their diet with fishing and hunting. Although they lived in villages, there was regular seasonal movement in a fixed pattern to take advantage of the resources. Villages were generally small and rarely fortified until they were living under constant threat after 1630. Although they sometimes joined in loose alliances, their lack of a durable central authority before contact was a clear indication there was little intertribal conflict. By far the most distinctive characteristic of the 'Metoac' was their important role in native trade. It was the severe misfortune of the 'Metoac' to occupy the northern shore of Long Island which was the source of the best wampum in the north-east region of North America. Each summer, the 'Metoac' collected clam shells from the waters of Long Island Sound which, during the winter, were meticulously shaped into small beads. Strung together in long strands, they were called wampompeag - condensed somewhat by the English colonists into the more accustomed form of 'wampum'. The Dutch called it 'siwan' (or 'sewan'). The 'Metoac' traded this painstakingly-crafted product to other tribes (most notably the Mahican) and thrived as a result. Passed from tribe to tribe, Long Island wampum made its way as far west as the Black Hills of South Dakota! 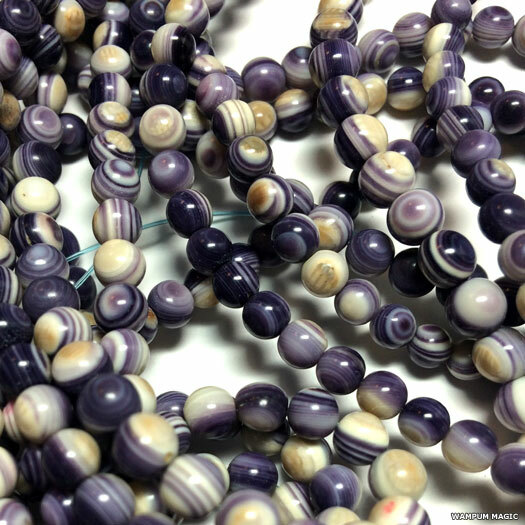 The strings of shell beads were sometimes employed as an elementary currency in native trade, but they were also valued for personal adornment. Arranged into belts whose designs could express ideas, wampum was also used in native diplomacy to seal important agreements, such as war and peace. It came in two varieties: white and dark (which varied from purple to black). In general, the dark beads had a value roughly twice that of white. The shells from which wampum was made were located on both sides of Long Island Sound, so the 'Metoac' never had a monopoly. Other tribes (Delaware, Mattabesic, Niantic, Pequot, and Narragansett) were also involved in its manufacture, but the wampum created by the 'Metoac' (from northern Long Island) was considered the best. After 1600, the European fur trade distorted the original purposes and value of wampum. Strung together and measured in fathoms, it became a medium of exchange in trade between colonists and natives which greatly increased its value. A passive people cursed with a prized resource, the 'Metoac' proved easy prey for more dominant and bellicose tribes.